IHOP Says 'IHOb' — And The Internet Says, What? The company wrote, "There's so many obtions, what could it b?!" — and one Twitter user replied, "Can you not blease?" IHOP Says 'IHOb' — And The Internet Says, What? IHOP has left fans scratching their heads, wondering what its promised name change to IHOb could mean. International House of Pancakes has created a stir by saying that after being IHOP for 60 years, it is "flippin' our name to IHOb" — setting off speculation over what that mysterious b could signify. For now, the company isn't saying. IHOP promises to reveal the meaning on June 11. But the Internet isn't big on waiting. Hungry for answers, people responded to the cryptic tweets: Could it be breakfast? Biscuits? Brunch? The improbable bancakes? Simply, and minimally, bacon? The on-trend bitcoin? Those are a few of the more popular guesses on IHOP's Twitter feed, in a thread that's littered with the company's coy responses — and an annoying/cute (depending on your patience level) insistence on replacing p's with b's. "Please tell me you're joking," a Twitter user named kayla said. "Oh blease, this is no joke!" IHOP replied. Patrick Ford tweeted, "I'm just over here wanting some answers! Stop b-ing elusive and tell me what the answer b!" — and the company responded, "batience, Batrick, batience!" After the company wrote, "There's so many obtions, what could it b?!" — Extra D0G replied, "Can you not blease?" Encouraging people to keep guessing, the folks running IHOP's social media account repeatedly cited the endless "possi-b-ilities." But at least two people noted that the company was missing out on a chance to say "bossibilities." One guess the company dismissed outright was "burritos." It did so without discussing "purritos" — but if you want to see photos of cute cats cozied up in socks, it's here for you. The hubbub over the "b" comes as IHOP prepares to mark the 60th anniversary of its first restaurant, which opened outside Los Angeles in the summer of 1958. Whatever the IHOPlan is for the chain's widely recognized name, it seems to have been long in the making: The Twitter handle for IHOb is already reserved and verified, having joined Twitter in July 2016. 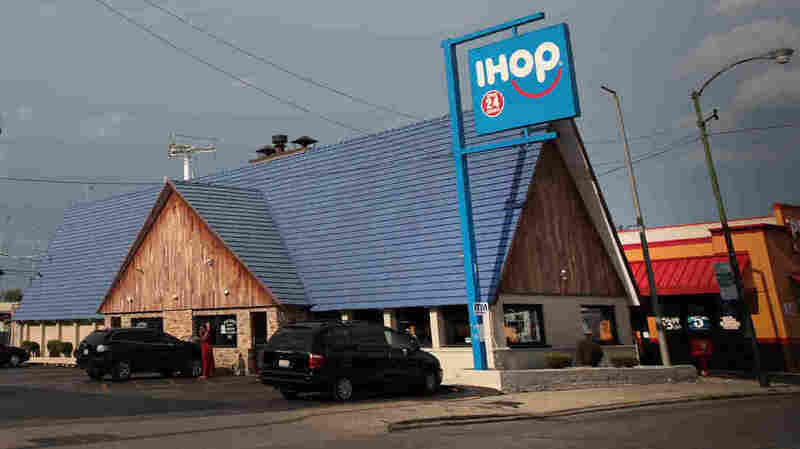 According to DINE Brands, which operates both the IHOP and Applebee's restaurant chains, there are currently more than 1,671 IHOP locations in the U.S. In the most recent fiscal year, IHOP stores generated $185 million in revenue, on sales of $3.3 billion. At its annual stockholders' meeting last month, IHOP reported that nearly half of its customers come in during breakfast time. Lunch follows (with 28 percent) and then dinner (16 percent) and late-night service (7 percent).